Subscribe to my RSS Feed to get a head's up when I add a new page. Springpots and Fabric Burners are the Best Fabric Pots! 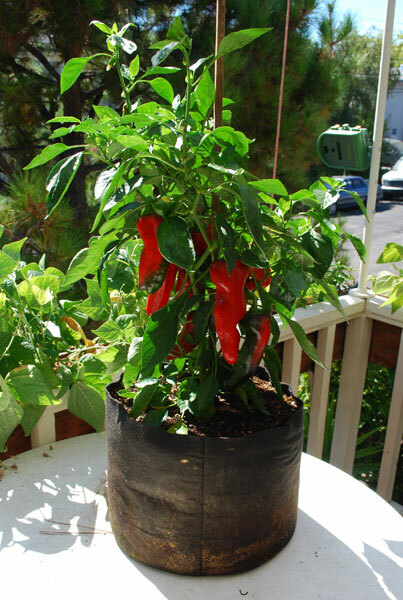 Springpots, Fabric Burners, and Sequoia Tree Pots offer the best value in fabric pots. Superior materials and design at a great price. Continue reading "Springpots and Fabric Burners are the Best Fabric Pots!" Eat Your Dirt Summit Goes Live Tomorrow! 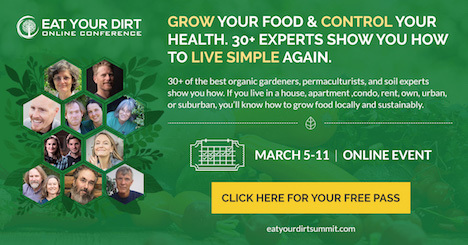 A reminder for those who have signed up for the Eat Your Dirt Summit--We go LIVE tomorrow! The Summit features 30 Edible Landscaping, Organic Gardening, Permaculture, and Sustainability experts. It's not too late to sign up! YOUR FREE PASS gives you rolling 48-hour access to ALL the conference content. I'll also be available on Live Q & A Sessions on Monday, March 6th at 11 am EST (8 am PST) and Thursday, March 9th at 3 pm EST (Noon PST). Call with Questions! Continue reading "Eat Your Dirt Summit Goes Live Tomorrow!" 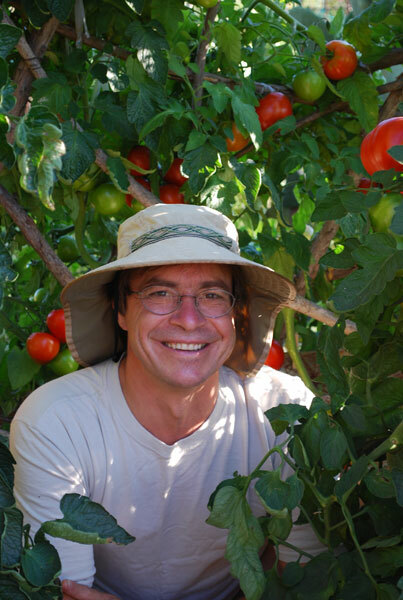 Join Me at the Eat Your Dirt Summit, March 5-11, 2017! The Summit features 30 Edible Landscaping, Organic Gardening, Permaculture, and Sustainability experts. YOUR FREE PASS gives you rolling 48-hour access to ALL the conference content. Live Q & A Sessions on Monday, March 6th at 11 am EST (8 am PST) and Thursday, March 9th at 3 pm EST (Noon PST). Call with Questions! Continue reading "Eat Your Dirt Summit, March 5-11, 2017"
I just won a "Best of Houzz 2014" award for Customer Satisfaction! Thanks to all my clients, especially those who wrote reviews for me. 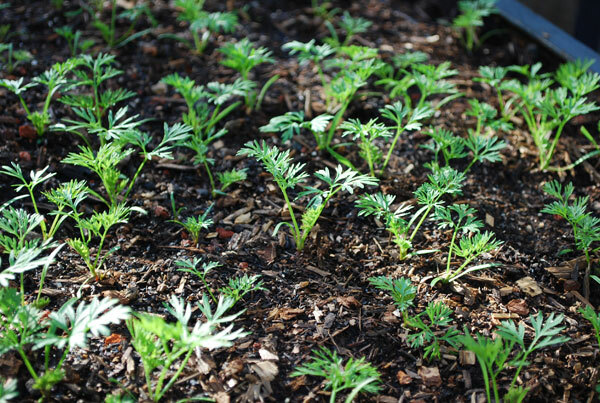 Just added some photos on "balancing" a carrot bed to my Growing Carrots page. 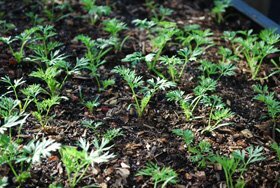 Carrot beds tend to be "clumpy", with knots of dense seedlings, and wide gaps in between. While the seedlings are still small, you can carefully "prick out" clusters of seedlings with a fork, to thin them out and fill in gaps in the bed. See Growing Carrots for more information. 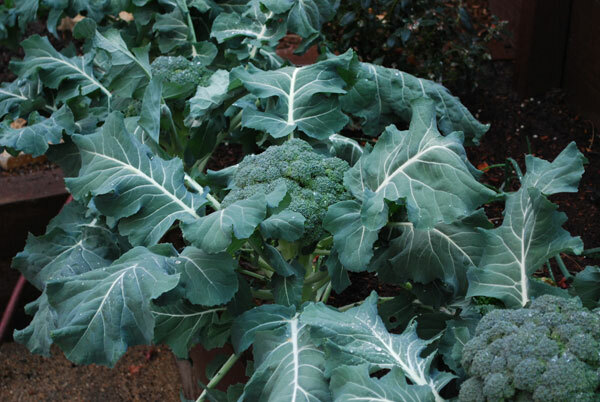 I just added a couple photos from a client's garden to my Growing Broccoli page. 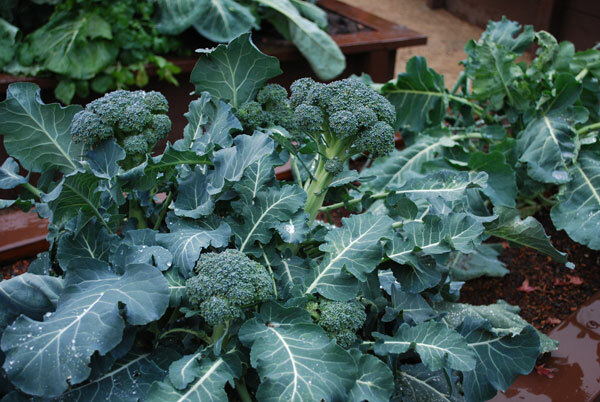 The photo on the left is 'Blue Wind', a very early broccoli variety with good side shoot production. It remains to be seen if its side shoot production can match that of 'Arcadia', the photo on the right. The main head was harvested 3 weeks ago, and this plant produced 9 side shoots, each the size of a small broccoli head on its own. Growing tomatoes in containers is often the only option for apartment-dwellers, but container tomatoes have advantages even when you have space for a garden. 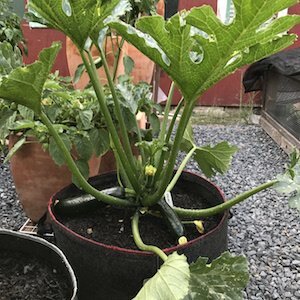 Continue reading "Growing Tomatoes in Containers, Growing Tomatoes in Pots, Container Tomatoes"
There was a great article on dragonflies as predators in the New York Times yesterday. They're probably the most efficient predators in the animal kingdom, capturing up to 95% of the prey they pursue. If you live near water, you'll find them patrolling your garden in lazy figure-8's, zigging and zagging to snag flying insects or chase rivals or mates. You can encourage their presence in the garden by adding a water element. 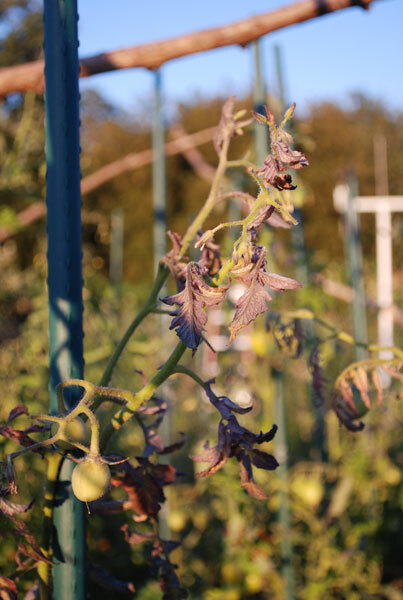 Continue reading "Dragonflies as Garden Predators"
I just put up one of the ugliest pages on my site, a new page on Tomato Diseases. This is one of the only pages on my site where most of the photos are not mine. As a gardener and photographer, ugly is hard for me to do. Brown is the color of failure in a garden. When I've seen tomato diseases in the past, I've identified them, then done what I could (if anything) to help the plant recover. Usually, I just yank the plant and throw it in the trash. Fortunately, University extension services are good at ugly photos. So for this page, I reviewed several publications on each of the main tomato diseases. Under each disease, I used photos from the best publication on that disease, then linked to the publication from my site. This page should be useful for gardeners looking to diagnose sick tomato plants. It has photos of the main tomato diseases, all in one place, with links out to detailed information on each disease. One disadvantage of extension services is that they usually recommend chemical fungicides to deal with tomato diseases. That's where my section on organic solutions to tomato diseases comes in. We get a lot of requests for prints of photos from Grow-it-Organically.com, so now you can purchase prints of our best pictures. You can get canvas, acrylic, metal, and art prints, in sizes ranging from 8" x 5" (gift cards) to 30" x 20" and larger. You can order without frames, or select from a wide range of colors, shapes, and sizes of frames. The images are perfect for brightening up a kitchen, dining room, outdoor dining area, or office. If you order a frame that matches your window casings and delete the mat, it will look like you've added a window looking out on a garden. This is a great resource for interior designers and people staging properties for sale. A sure way to make a space pop is with high-quality, clear, stunning images. If you know an interior designer or real estate stager, send them a link to this page. I'm just getting around to posting photos of last summer's peppers. 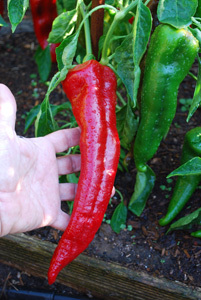 Here's a gallery featuring 'Carmen', a red Italian bull's horn (Corno di Toro) pepper I tried for the first time this summer. I'll be growing this one every summer from now on! 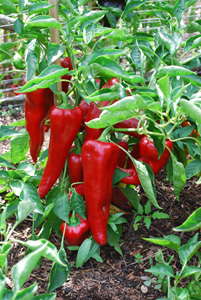 You can see other recent additions at my Pepper Varieties page. Jim Robbins had a piece in the New York Times about worm farms and the benefits of vermicompost. As I've said for years, the worm gut is loaded with beneficial bacteria and fungi, and the castings are inoculated with these microbes as they pass through into the soil. These beneficial microbes enchance plant immunity and outcompete pathogens in the soil. 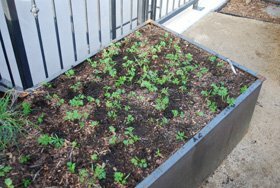 I've used fresh worm castings in my salad tray flats, potting mixes, and seed starting mixes for years, it's part of why my plants are so robust and healthy. The only disadvantage of worm castings is they're expensive to buy. 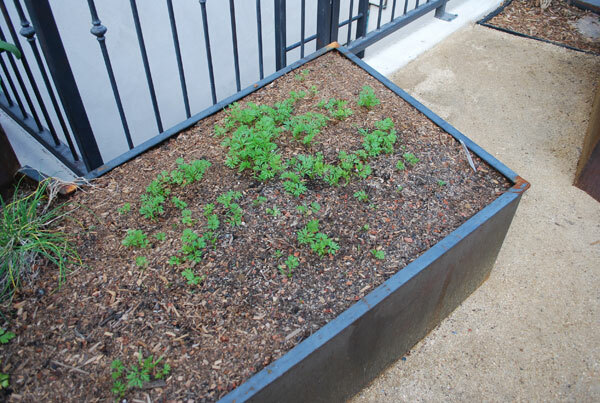 If you use a lot of them, like I do, you'll want to set up your own Worm Composting System. 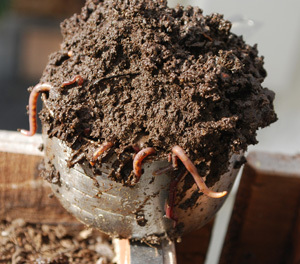 That way, you can turn kitchen scraps and shredded paper into worm castings, a probiotic for your soil. 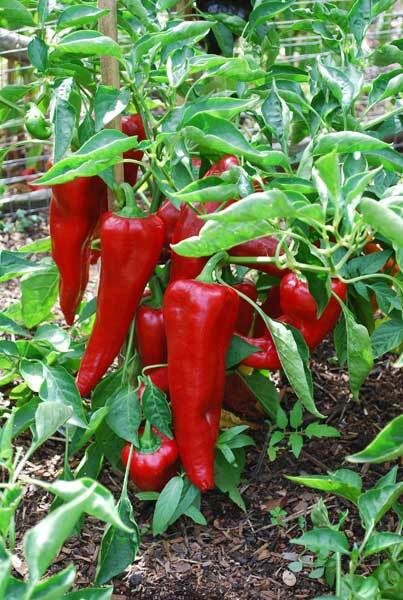 Fresh worm castings are even better than bagged castings, because you get a few worms with them, and the worms help cycle nutrients in container vegetable gardens. 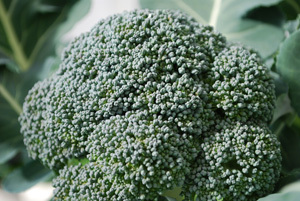 Continue reading "Worm Farms in the News--New York Times Article"
Harvesting broccoli is all about timing. You want the heads to grow as large as possible, but harvest before the florets swell too much. Continue reading "Harvesting Broccoli, How to Harvest Broccoli"
Starting tomatoes from seed is the best way to explore new tomato varieties, and the cheapest way to grow a lot of tomatoes. Here are three keys to success. Continue reading "Starting Tomatoes from Seed, Growing Tomatoes from Seed"
The tomato hornworm is the most visible insect pest of tomatoes. Tomato worm infestations may start small, but quickly become damaging as the tomato worms–and their appetities–grow. 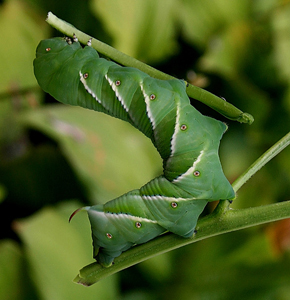 Continue reading "Tomato Hornworm, Tomato Worms, Tomato Horn Worms"